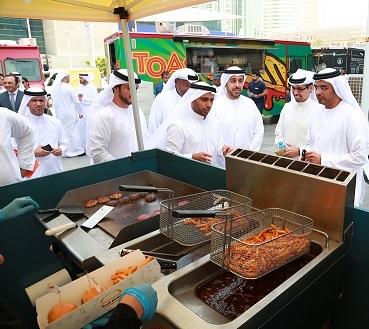 The Dubai Chamber of Commerce and Industry initiative, Tejar Dubai entrepreneurship development programme, launched three commercial projects with the opening of the Roundup Food Trucks, Hamburgah and Maitha Al Zaabi Financial Auditing and Consulting. The objective of the training programme is to support creative and commercially-minded youth to help turn their business ideas into reality. The three new commercial projects were launched in the presence of Dubai Chamber officials including H.E. Majid Saif Al Ghurair, Chairman, H.E. Hamad Buamim, President and CEO, and Essa Al Zaabi, Senior Vice-President, Institutional Support Sector, and General Coordinator of Tejar Dubai. H.E. Buamim stated that the launch of these projects reflects the Chamber’s commitment to support the culture of entrepreneurship while helping young Emiratis to enter the world of business with their own commercial projects. The entrepreneurship development programme not only supports the young entrepreneurs to develop business ideas but also provides them a wide range of training and tips from experts in the field, he said. He praised the enthusiasm shown by the young entrepreneurs in coming up with innovative ideas while striving hard in turning them into a viable business project and wished them all the success in the competitive business world. Hamburgah is a fast food dining burger catering. Its menu consisting of two types of burgers and a number of side orders like French fries, is designed to provide customers with easy ordering experience as they come to your location to do burger catering for small and medium events like birthday parties, family gatherings and expos. According to Ahmad Almulla, owner of Hamburgah, the idea behind the setting of this fast food chain is to provide customers with an easy ordering experience. The idea is to do burger catering for small and medium birthday parties, family gatherings, expos and events. He informed that the idea behind the setting up of Hamburgah stemmed from the demand in fast food catering which has a good potential for growth adding that Hamburgah stands for quality as the company has unique buns and adds high quality ingredients in the preparations. Almulla also lauded the support provided by Tejar Dubai, right from training and guidance in the financial and operational plans up to the setting up of the project. He expressed his desire to take his project to shopping malls while calling upon young Emiratis to enter the world of entrepreneurship and hone their talent in the business world. The Maitha Al Zaabi Financial Auditing and Consulting firm provides financial advisory services to small and medium-sized enterprises on legal issues, financial guidance and recommendations, bookkeeping, and internal and external auditing services based on International Financial Reporting Standards (IFRS) and the UAE law. Maitha Al Zaabi stated that the auditing and consulting field has always attracted her and that has inspired her in getting the professional certificates and extensive experience in this area which will come handy in her business. She also thanked Tejar Dubai, for helping her in the establishment of this business while transiting into the world of entrepreneurship. Al Zaabi added that the Tejar Dubai programme helped her immensely in completing Government formalities like licensing while the training and various workshops offered by the programme set her thinking about the project’s expansion in the long run. The Roundup Food Trucks is an enterprise that rents out and sell trucks for food catering businesses, promotion of products and offering of ATM or other mobile utility services. These trucks can be booked through a smart application as the company can also obtain required government permission for the mobile service. Rafia Al Mulla, owner of 54º East company, which provides the Roundup Food Trucks for rent and sale to catering and other businesses offering mobile services to customers, informs that this new concept in mobile catering is growing fast and is quite popular in the hospitality sector. These trucks can be booked through a smart application and can be used for offering all kinds of mobile services including promotion of products and banking and other services, she said. Almullah is also working on the establishment of this type of ​​mobile services in Dubai as she says that this involves low risk and high returns and is highly flexibile, noting that the idea is based on the rental or sale of mobile trucks as the company also helps in obtaining the various government permissions required for mobile catering. She further pointed out that the mobile services sector in the US totals USD2 billion with an annual growth of 20% as she is looking forward to Dubai to achieve a higher growth level due to the emirate’s strategic position as a global hub in mobile services, especially in the field of innovation and creativity. Almullah currently has more than 12 trucks and plans to have 100 such trucks by the end of the year as she lauded Tejar Dubai’s efforts in facilitating her nurturing in the field of business as well as the counselling provided to her in the realisation of her dream project. On his part, Essa Al Zaabi stated that the Tejar Dubai programme has thus far launched 7 commercial projects and with this launch the number has shot up to 10 which has come in a year’s time. This shows that the entrepreneurship development programme is headed in the right direction in providing guidance to the young Emirati talents’ innovative ideas while inspiring them to set up their own businesses. Al Zaabi pointed out that the Tejar Dubai programme’s training workshops and guidance help create an ideal platform for the development of young entrepreneurs and provide them the advice and expertise needed to launch their projects, adding that the remaining part of the current year will see at least four new projects being launched which will complement the efforts of other enterprising participants of the entrepreneurship development programme. Under its three key pillars of assess, assist and attain, the Tejar Dubai initiative, launched by Dubai Chamber, provides youth with access to an extensive development programme, including classroom learning, on-site training, mentoring and business advice, as well as networking opportunities with local and international business leaders and access to investment capital while helping them establish their own small-to-medium-sized businesses. With its commitment to the directives of H.H. Sheikh Mohammed bin Rashid Al Maktoum, UAE Vice-President and Prime Minister and Ruler of Dubai, which emphasises that entrepreneurship is the shortest route to a bright future, the training programme aims to find and train creative and commercially-minded youth to help them turn their business ideas into a reality.